Posted by Nicole Frain on Oct 31, 2017 in #Recipes. Trick or treat? We vote treat. 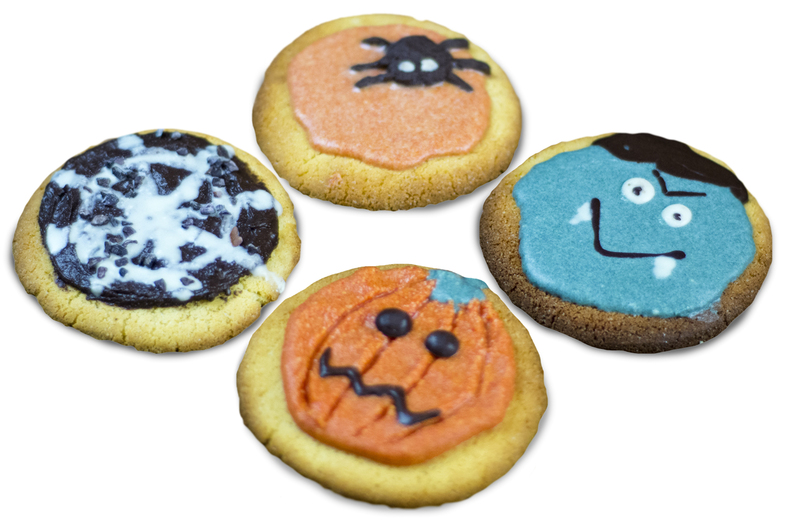 Treat yourself this Halloween with these seemingly spooky, yet delicious Halloween Cookies! They’re low carb, high protein and are sure to satisfy the tricksters in your family. Don’t be afraid… Indulge in one today. Set oven to 180 degrees and line two trays with baking paper. With an electric beater, whip butter and/or coconut oil and Sweetvia until pale and creamy. Add the egg and egg white and continue to whip. Turn down to a lower folding speed, or use a wooden spoon to mix in remaining cookie ingredients. Once mixed turn on to a floured surface, or between two sheets of baking paper and roll out to 1cm thick. Use a cookie cutter to cut dough and place on prepared trays. Bake for 10-12 minutes until golden brown and allow to cool on a wire rack. Mix three tablespoons of coconut oil with the Whey Hot until a thick paste forms. Add food colouring as desired and spread over cookies. Melt dark chocolate with one tablespoon of coconut oil until a thin icing forms. Use this to get creative with cookie designs and start topping with spooky artwork!